Magma is a factory specialized in the production of machinery and plant for the application of polyurethane, epoxy, phenolic, silicon resins, etc. To this activity, it adds the direct experience in the spraying at end that supply the know-how necessary to the design mindful of the requirements and possible problems of the final user. Considering the customer requirements, it studies and realizes customized equipment following the production and use requests paying particular attention to the dimensions, overall dimensions and handling. In order to assure the correct product working, at the delivery it arrange to directly teach the personnel involved in the equipment use. It supplies assistance both by phone and by direct intervention at customer premises; in case of maintenance, the supply of spare parts occurs in order to limit at maximum the customer inconveniences due to machine stop and relevant costs. 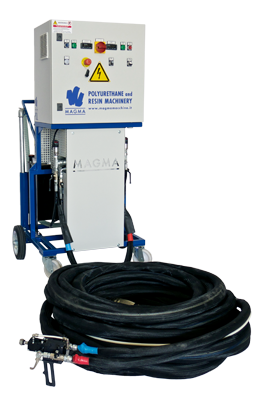 Thanks to the mobile equipment of its own design, Magma is able to directly carry out all the applications by spraying, casting, injection both of rigid foam both of special bicomponents (polyurea, elastomers, compacts). This is an activity necessary to test on field technical solutions that are transferred on the proposed products.